edition of The BeHappy! Newsletter at the beginning of December for the happiest holiday season possible! I am a doctor, “rejuvenating” corporate executive, entrepreneur, author, and speaker. My wife (Jill), our four-year-old daughter (Joie), our 9-month-old second daughter (Jae), and our golden retriever (Sunny) live in Tampa Florida and Newport Beach California (we alternate locations every month – so we travel a lot). A recent study indicates that if your income is less than $75,000 per year, more money actually can make you happier (click here to read an article about it). Poor health is exacerbated by a low income. Lower income (less than $75,000 per year), for example, has been associated with a higher risk of heart disease. The incidence of divorce is also increased in lower income groups. Are you stressed out? Are you anxious a lot; perhaps even on medication for your anxiety? Most importantly, is the stress and anxiety you are feeling affecting your happiness - and perhaps even your relationships? If the answer to any of these questions is 'yes', then please click Here NOW! to learn more about the "Linden Method" for stopping stress and anxiety. This is the world's #1 permanent cure for stress and anxiety. If you're affected by stress and/or anxiety, it will change your life ... 100% guaranteed!! Become anxiety disorder and medication free! The average life satisfaction (happiness) of people who live in wealthier countries is greater than poorer countries (with a few exceptions, the least happy nations in the world are the poorest, and the most happy nations are the richest). The last edition of this newsletter in July was about dealing with adversity and managing the stress in your life more effectively by experiencing gratitude daily, improving your attitude about life, and creating the fortitude necessary to "weather any storm" (click here to go back and read the previous edition of the newsletter). Did you do the Three Great Things exercise every night for the past 60 days? If so, how do you feel about your life now compared to how you felt 2 months ago? If you are like most people who do this exercise regularly, life is much "brighter" right now for you, even if the circumstances (problems, stresses, or worries) have not changed. If you didn't do the exercise for the past 2 months, I'm sure you are not alone. Most people don't follow through with things like this because it hasn't become a habit. So if you feel you need to be more grateful for the things you have in your life right now, give it a go. Commit to doing this quick and easy exercise for at least a week. Then commit for an additional week. Take one week at a time until it becomes a habit. I am certain it will improve your life significantly. You will be more grateful, have a better attitude about circumstances and events (including the really tough ones) and have a better ability to manage the stressful, difficult issues we all face in life. If, however, life is just too stressful for you to even think about doing this, and the stress is getting to you, it might be a good idea to explore the product in the box to the right - The Linden Method - which is a very popular and effective system for managing stress in your life. There is no risk to checking it out; and who knows, it could be the best thing you ever did. As stated in the "note" at the beginning, this edition of The BeHappy! Newsletter may not be for everyone, because it's about money, and specifically about making more money than you are currently making and having more money than you currently have (although I believe everyone should still read it and consider the possibilities for your own life). Last year at this time, this newsletter was also about money (in general terms) - and how money might (or might not) relate to happiness for you (click here to read that edition of the newsletter). But just recently a study came out indicating that money IS generally an important component of happiness - where the study found that an annual income of less than $75,000 was shown to be the level where people are "less happy" overall. Due to this recent study, and because it's been a year since I've talked about money in this newsletter, and since the economy is still very difficult and "stressful" for most people, I thought it would be a good time to discuss money again (in fact, I might make it an annual topic at this time of year). So, that's what this edition is all about, and although it's not for everyone, my objective is to help motivate you to explore and improve the financial side of your life if that's what could make you happier (or even if it's just something you "need"). This time, though, I want to get more specific on the topic of money - and really provide you some resources on how you could possibly increase your income, perhaps even get wealthy, if having more money is important to you and could make you happier. Would you like to have more freedom in your life (the kind of freedom more money could bring) to do the things you'd like to do as often as you want? Would you like to buy a nicer, bigger home, a vacation home, or a new car or boat? Do you want to spend more time with your family, or have more free time to do volunteer work? Get your copy of this valuable eBook for only $1.75 by clicking here. Are you unemployed or unhappy with your current job or career and "wish" you could do something else to "make a living"? Are you "retired" on a fixed income and want to live a more prosperous, adventurous life? Or what about just having the peace-of-mind of knowing you could send your children to any college they want without having to worry about how to pay for it? These are all questions many people could be asking right now which could make having an extra income (or a completely new source of income) a very positive thing. I know it is for me. I left my "job" (and really my whole career as a biotech CEO) exactly two years ago this month in order to be able to pursue some of the passions I have in life, like spending time with my family, traveling, writing, and speaking. So, replacing that income is very important to me - and to my family. The reality, though, is that life is full of uncertainty, and now for me - with this change in my career and income - uncertainty is at a very high level (which is why this multiple streams of income strategy and these additional sources of income below can be so important). What about you? Is the level of uncertainty in your life high? Does any uncertainty you are experiencing - to whatever degree - "worry" you? Is financial uncertainty a big issue? Or, do you just want to do something part-time that can help generate a few hundred or a few thousand extra dollars a month? If so, the next section of the newsletter could be very important for you. And even if not, you should still stick with this. You just might find a whole new strategy for creating wealth and a lifelong additional income. In this brief newsletter, I can't get into detail about this whole topic since it would require a complete book (or more) to fully explore. So, for those who are interested in exploring this area of your life more, I'm going to summarize the main points and give you the opportunity to further explore whichever "strikes you" best. And there are many other ways. And let me tell you, I have done all of the above, most quite successfully. 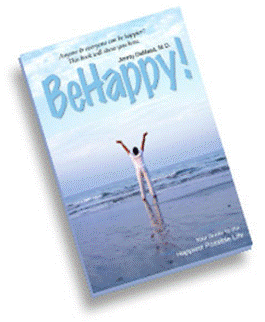 Specifically, if you have read my book, BeHappy! you know that I left my medical practice when I was in my early 30's, went back to school to get a business degree (M.B.A.), and got into the pharmaceutical industry, ultimately becoming a biotech CEO around the age of 37. In addition to this change in my “primary career”, I have also purchased and run 3 different franchises in various industries (investing hundreds of thousands of dollars in the process), started 5 businesses (all of which are currently operating successfully), invested in real estate, used my hobby of writing to publish a book and start this website, started a network marketing business (currently operating), and created an internet marketing business (currently operating). Yes, I have been involved in many different businesses and wealth-creating opportunities - and truly believe in the multiple-streams-of-income philosophy of creating financial wealth and freedom ... all for the ultimate goal, which is to BeHappy! [NOTE: although not the highest priority in my life, wealth and financial freedom are a part of my personal Definition of Happiness]. Using this experience, if your Definition of Happiness includes a financial component - and maybe even if it doesn’t - I’d like to introduce you to 4 strategies to consider if you want to make more money, generate an income (whether it's a supplemental part-time income or a significant full-time income), and/or create long-term wealth in the quickest, best way possible. provide your e-mail address, tell me you are interested in learning more about internet marketing, and I'll send you some FREE reports I've collected which have helped me a lot. If you click on the links above for each of these four income-generating and wealth-building strategies, you can get a little deeper into the topic to better assess whether it's something for you or not, and can get access to some of the "products" I've used to help me in my business-building, income-producing, and investing efforts (you can also check out these and other types of money-related strategies in the "Money & Wealth" section of BeHappy101.com by clicking here). I have chosen these four general areas as the primary and immediate strategies to explore because they are the best methods I have found to make additional income - and even get wealthy. Each has its own specific advantages and risks, which, if you are interested, you can explore more thoroughly. If you were to explore internet marketing a bit further, for example, you would see that you can literally be making money online by this time next week, with less than a $100 investment. With real estate investing, on the other hand, a more long-term approach is required, generally with a larger investment required. Network Marketing, a business strategy some people wrongly shy away from, is all but guaranteed to provide a passive residual income if you (a) align with the right company and (b) work at it (with a relatively small investment). And, finally, with stocks and bonds, the risks must be considered carefully – with both long and short-term potential. Yes, money is part of life. And, depending on your own personal goals, values, and traits, more money may be a significant part of your life and your happiness. So, if you are interested in moving ahead, I urge you to click on each of the four income opportunities listed above to learn more about each of them (which is really part of the "60-Day Actions" section below). Explore the possibilities for your own life. I believe it could be very beneficial to your total happiness (especially if having more money is important to you). Then, please read on and continue with the "Actions" described below to help you potentially start improving your financial life right away. The action plan for the next 60 days basically involves exploring and starting to better understand some simple ways you can either augment your income (if that’s what would help you most), change to a completely new “primary source of income” (if that’s what you need to be happier), and/or create a plan to generate significant wealth for yourself. For this newsletter, I’m going to stick with the 4 ways described above. Before exploring these in further depth, though, it’s important to have the right “mentality” about it all. Write down your thoughts related to each of these four "money" issues. Take an hour right now to get started, because if you can get this process started, and then take the next 60 days to create a plan to improve your financial life, you could start to create a whole new, "freer" future for yourself and your family. And, if you decide it isn’t for you – or you just don’t want to commit to it – you haven’t lost anything, but rather gained a bit of knowledge - both about money and about yourself. Once you are confident you have the mentality required for you to generate additional income and accumulate wealth, the action to take next is to explore one or more of the 4 strategies I mentioned above. Just click on the links which interest you. Read up on the subject. Get the additional information I have provided as part of each strategy. Decide if one particular technique appeals to you and, if so, begin to create a plan to implement the process. There is a lot of information available on each of them. Spend the next few weeks understanding the pros and cons of each strategy. Know the risks involved. Then, when you have a bit more knowledge – and have made the commitment to implement the strategy, dive in. Take the first step toward following a plan to generate the income you want and achieve your financial goals. If you want to take this a step further, you can sign up for one-on-one personal E-Coaching by clicking here and I’ll help you personally with all this. We’ll look back on this 60-day action plan in the next edition of The BeHappy! Newsletter at the beginning of December - where we'll be in full "holiday season" mode. In that edition, as always, we'll explore ways to get through the holidays with less stress and more joy and happiness - and to prepare for your best year ever in 2011. Rudy Wietfeldt and Steven Diamond. Check out the initial website at BeHappyForLife.com.